Late afternoon – a few jingle of the Ghungroo/Ghungur ( Images of Ghungroo) & a holler ” Garam Chanachur” (Hot Spicy Mix) ,would draw all the kids in the neighborhood out of their front door to the iron grilled entrance gates of their houses, the little ones clamoring & climbing over the horizontal bars of the gates for a better view. It was the “Mix-wala” (the person who makes mixes..). He had all that he needed hung in a neatly sectioned container around his neck with a broad wide belt ( never wondered then if it hurt him to carry all that weight around his neck) & he would have the Ghungroo tied on one his wrists. It would be our school vacation time, & all the kids would wait for him after the very forceful afternoon naps, for he made the most lip smacking mixes; he had 2 kinds, one of the fresh soaked brown chickpeas mixed with spices, green mangoes, onions & lemons & the other would be a not so healthy Chanachur Mix with similar spices. The Chanachur mix would be served slightly warm, I have no idea how he managed to keep it warm but he did! – therefore the Garam Chanachur. How he made them was easy but spectacular, & all of us would wait not only for the treat but also to see & hear him do it. He would mix all the ingredients approximately (at least it appeared that way, but the taste never varied, so he must have had the magic going on) in a steel canister. The canister would then be covered, he would would shake it with a tap of his feet & beat on the lid with the hand that had the Ghungroo, making the most amazing music;-) It was a vision of art! After a few shakes, he would rest his container in the tiny space he had on his box, pull out square piece of newspapers, twisted the paper to make a cone, & pour out the treats in these recyclable packs – all of them in the exactly same looking mounds. We would then pay him one by one with the coins which we held in our sweaty palms & take the cones with shiny eyes & the sensations tickling the tongue. Quite a treat. This is not a fancy recipe as you can see, rather a no recipe at all. It is charm from the past which I wanted to re- live & share today. However when I do eat it esp. in the newspaper cones, it is some unexplainable satisfaction. Musings of some memories just have to make one smile. I will give approximate amounts here for the recipe; change the spice amounts to taste. 1 Cup Dry Brown Chickpeas/Chola/Bengal Grams/Kala Chana (Different names but the same thing) – Use regular boiled chickpeas if you would like. Soak the Brown Chickpeas overnight. Drain & dry them with a paper/kitchen towel. Combine the onions, mango, cilantro, pepper, salt, chilli powder & lemon juice with the brown chickpea in a container preferably with a lid/cover. Cover it & give it a big shake, shake, shake. I just found out from my cousin sister who recently came from India, that this man is still making his rounds around the neighborhood, entertaining probably the next generation of kids now, just like he did before! Next time I visit I want to meet him & have this delightful savor straight from his container. 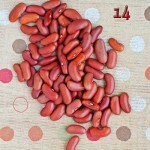 Susan of The Well Seasoned Cook is holding her Creation MLLA #14 at her place this time. I am sending this my very favorite memory & snack of my childhood to her. Soma,made me nostalgic too…even i have this bell ringing past with me..such a beautiful narration from you Soma.and the photos look gogeous !! It’s amazing how different people from different parts of world, share the same feelings and musing memories associated with a particular food or in this case eating style. 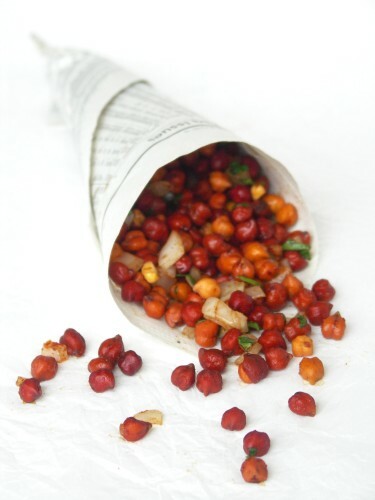 As a kid, these MIX MAKERS and Kulfi waalas, Bhutta (corncobs) waala and panipuri waalas were almost like RELATIVES. They knew the kids with their names, chitchatting with us they mixed the bit of this and bit of that food, and keeping a track of which kid likes more spicy , which one like more onions, which one is allergic to lime etc. Nowadays we are so scared to let our kids talk with strangers but during those years, life was so simple. Even now when I visit my mother’s place most of such uncles still come there , selling these items and they even now enquire our well being. They all have grown so old and frail but the food still taste as great as ever. And yeah the kala chana mix, chana chor garam, sukha bhel(dry bhel), Sugarcane(peeled and cut into pieces), candy floss(they use to bring a simple machine on bicycle and put some sugar crystals and run the machine, much to our delights pink/orange coloured floss used to magically appear from nowhere.it was so exciting)..Awww I just can’t stop now…but have to..can’t hog all the space here. Thanks for making me relive the beautiful childhood with this yummy snack. Alka the space is all yours:-D you made it more nostalgic! Great presentation Soma, beautiful pictures recreating your/our childhood memories. Delightful! the story and the snack. All the chat shops in the world can’t recreate that magic. Brilliant…my past is ringing here too. I remember sneaking out of the school gate to grab any ‘rubbish’ like this coz my Mom wouldn’t let us buy stuff fom the roadside. We ate like mad hatters & never fell ill! FUN days!! My dad makes stuff like this sometimes ( a similar one with split chana dal soaked overnight too)…and we enjoy it on rainy days! It’s a great post Soma! Beautiful narration Soma. This is such a simple and beautiful recipe. 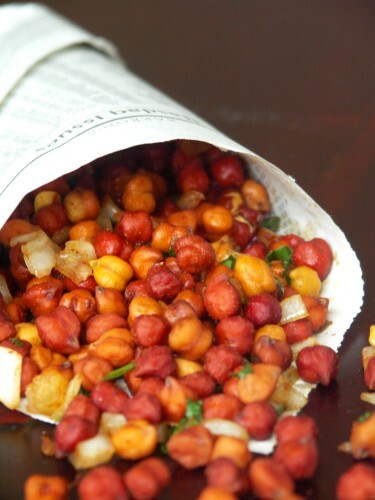 We never had the chana wallas in bnagalore, but I can realte to the story/description. ah ha re…what a treat to my memories…….u got me sooo nostalgic !!! didi, we had such wonderful days then….love u for not just being my sister..but for being my mentor, my guide n my most trusted friend !.. I can picture that mixwala with his container strapped around his neck…what an evocative post, Soma, and what a delicious snack to go with it. I love anything with chickpeas in it, but with green mango and onions it must be a treat to die for! I’ve had regular toasted chick peas before. But the spiciness of this dish would knock me off my feet. I love the sound of it. Beautiful and lovely post and a great healthy snack to go with it ! Thank you so much Aunty!! Soma , you made me nostalgic ! remember the song “chana jor garam babu main laayi mazedar ” from kranti !! It was such a bad picturization , but as kids we were in awe of hema malini dancing away trying to rescue the hero !!! 🙂 Lovely pictures of the chana. Recently there was an episode on No reservations by anthony bourdain which showcased street foods of calcutta and mumbai ! Although I am not Indian, I do know of the nostalgic charm of the wala. It was before my time, but my Mom tells me of American vendors who would travel the neighborhoods here, purveying comestibles, as well as services, like sharpening knives and fixing umbrellas. In the States, it is nearly unheard of today. So sad. Community is gone for Wal-Mart. Your chole is lovely. I want to scoop a handful up and enjoy this healthy snack. Thanks for sharing your recipe for MLLA14. Susan, we used to see the knife sharpeners when we were little, but they don’t make their calls anymore. A lot has changed in India too, but we come from a small town.. & even after “urbanisation” it still retains some old time charms. Awesome pics Soma..I can relate to this very recipe and the street vendors!I posted a similar one a month back and when I look at yours, so nice to see different ppl sharing their expncs abt the same recipe!The mango is a great addition! I know when you say, the mix-wala has sweaty hands when you pay him the money..I was laughing here how we used to drop the coins from a height so as to not touch the hands.. Regarding your qn of what you shud call me, you can call me Shri;)Pretend you don’t know my real name or even that you read my tag:D How is that? Well,seriously..You can call me S or K;)!!? These bring back similar memories for me. No spices and we bought before watching a movie, but wrapped in newspaper just like that. I’m going to try these – thanks! wat a lovely calming picture!! Superb!! This sounds yummy, would love to try! Fabulous picture! This post made me nostalgic. What a colorful pic! Looks authentic wrapped in the newspaper. love chickpeas….look delicious….can eat everyday….U surely reminded all us indian about our fast food snacks……till date whenever i go to my mom’s house, i eat kulfi, sugarcane,dahi bhale to name few from these street vendors……& this dahi bhale wale bhaiyaJee(still same person)…….i only have to stop him once after that every day till i’m there he’ll call on the gate & make a plate for me…. Thanks all for sharing the Nostalgia with me! awww…what a wonderful post. Love the colours! That’s a great snack and great memory to go with it! Sounds like so much fun. Great story, and a very nutritious childhood snack. Looks good, too. Are you sure that chana were not boiled? Just soaked O/N? Yes I am sure. 🙂 . 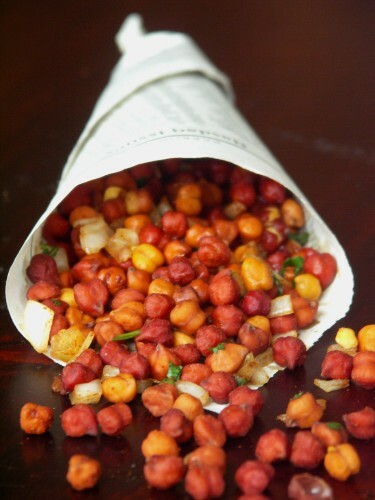 In West Bengal kala chana is often not boiled in snacks like this & also “jhal muri” (puffed/crispy rice mixed with other fresh ingredients) & “aloo kabli” (boiled potatoes with chana, onion, peppers & spices).. I grew up eating them!! This is not something I could forget. Wow, my favourite chanchor…looks gorgeous. Soma, I made this last evening as a rainy day snack. Very tasty and healthy too. I had to boil the chickpeas since they were still hard after soaking. This will be a frequent in my kitchen going forward. Thanks for the recipe. 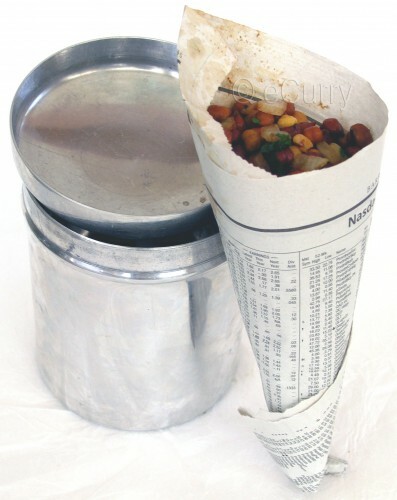 Like RC said, we never had these chana walas in Bangalore but can relate to your story/ incident.